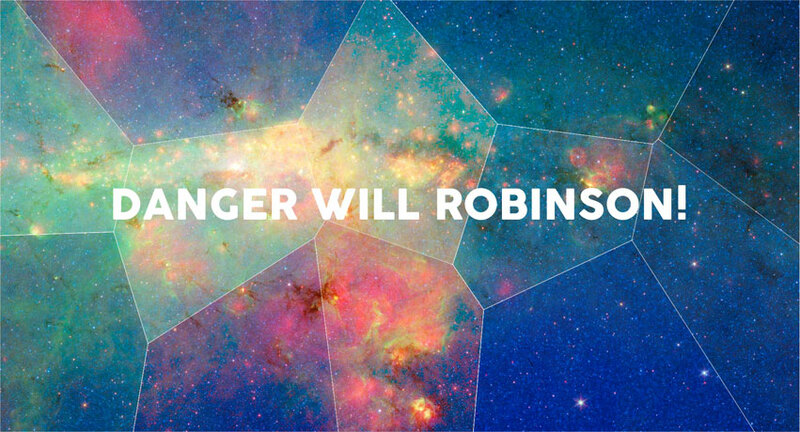 Andrew Frost, Curator of Conquest of Space: Science Fiction and Contemporay Art at Galleries UNSW, was going to open the recent Fly-In Fly-Out exhibition Danger Will Robinson! at AirSpace Projects. Due to an ‘outage’ at Sydney Airport, Andrew was stranded in Brisbane and declared Lost in Space. Needless to say he did not make the opening. Andrew did write an opening speech and today, thanks to his generosity, we are able to post it on the AirSpace Projects site. I have included it here but it’s usual home will be on the Danger Will Robinson! page in Past Exhibitions. One of the most critically important science fiction short stories of the modern era was written by someone you’ve probably never heard of – the author’s name is Pamela Zoline and her story is The Heat Death of The Universe. Published in the July-October 1967 issue of New Worlds magazine and described by the Encyclopedia of Science Fiction as an iconic works of the New Wave, the story has been anthologised at least nine times in various influential short story collections and is now widely available as a PDF online. Another fascinating aspect to the story was that it was produced by an artist. Zoline who was at the time a 26-year-old American expat living in London interested in radical art and agit-prop and had become a part of author-editor Michael Moorcock’s Notting Hill artist circle. Moorcock was the new editor of the previously staid and formulaic New Worlds magazine and he had quickly turned it into a radical publication with an editorial manifesto that sought to change the very nature of science fiction itself. Around the magazine Moorcock had rallied a group of distinguished writers and critics to help him win support from the British Arts Council to help finance publication. And along with many other artists, Zoline contributed illustrations for New Worlds and Heat Death was the first story she’d written since high school. It appeared in the same month that one of her paintings was exhibited at the Tate Gallery. Zoline was a highly active member of the Notting Hill group both as an artist and writer and she facilitated a number of the group’s more radical excursions outside the strict confines of the SF print genre, among them JG Ballard’s sole foray into becoming an exhibiting avant garde artist – it was Zoline who had curated Ballard’s Crashed Cars exhibition at the Camden New Arts Lab in 1970. Today the New Wave itself isn’t so well known outside SF circles, but it forms one of the first significant breaks in the otherwise conservative history of the genre. In essence, the New Wave was the intrusion of avant garde and modernist experimentation in both writing styles and subjects of science fiction, but also a tactical alliance with like-minded radicals in visual arts, design, film, media and television. Form the perspective of the future looking back to the art practices of the 1960s, it’s interesting to note that today the entirety of Zoline’s practice – from painting and illustration to writing and curating – looks like the CV of any number of contemporary artists. But in the late 1960s the silos of creativity were still very much in place and the mainstream of SF was embodied by long running US magazines such as Astounding Science Fiction whose editor John W. Campbell was writing infamous editorials that, for example, called upon the US government to use its troops to fire upon anti-Vietnam war demonstrators. In the heightened political fever of the late 60s, in the era of Paris, Prague and Mexico City, in the era of student unrest and the expanding American wars of South East Asia, science fiction was suddenly torn into two factions – the old guard vs. the new radicals. The New Wave was a genuinely multi-media avant garde, ironic and self aware, pretentiously sincere and, for about ten years from 1967, a challenge to the orthodoxy of mainstream SF. Like all radical movements it eventually descended into a mannerist phase before fading away completely in the noise of the post Star Wars era that began in 1977. But its effect could still be felt in he subsequent ructions that define the history of recent SF literature – cyberpunk was its spiritual heir in the 1980s and ‘90s and the more recent attempts to kick start a radical agenda in SF such as Mundane SF and or in the New Space Opera, each reflect New Wave’s world view. Zoline’s story is considered an important work in that tradition of radicality in SF because its form and content anticipated the meta-fictions of post modernism – its narrative the feminist redefinition of SF’s potential subject matter – and if we think of Heat Death as a work of art, it’s a valorization of the value of the everyday while questioning the hetero-orthodoxy of consensus reality. Science fiction is, in my view, a metagenre – a collection of ideas, themes, tropes and concepts that are easily recognised but devilishly hard to categorise. There’s no single idea or narrative structure that defines it, no setting or relationship that it can’t conceivably contain. SF, like most popular genres, is essentially democratic in the sense that its populism is accessible, and it evolves in response to its audience. And this is science fiction’s paradox – while it contains within it a vast field of practice and a huge potential for a true multiplicity – it has all like all mass genres a tendency towards a conservatism that is absolute and rigid. My view is that real SF is created from the outside – from the edges – in the zone of the science fictional, that space that produces odd artefacts that might not first appear to be SF but, like Zoline’s story, suggest another future – a space for otherness to flower, to take centre stage and redefine that rule of orthodoxy into a more agreeable and egalitarian present.